Hello again! 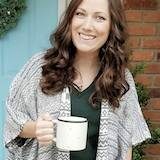 My name is Corinna and I’m a contributor here on the All Things With Purpose blog. On my blog, For My Love Of, you can find first time homeownership stories, crafts, home decor, and styling posts. 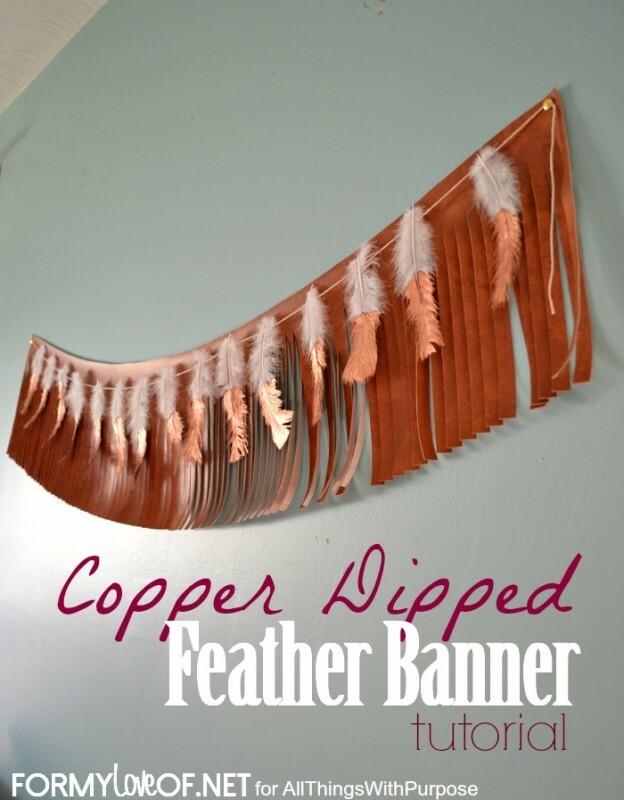 Today, I’d like to share with you all a perfect garland for Fall: Copper Dipped Feather Banner. This garland is really easy to whip up, and you may even have most of the supplies in your stash already. And, if you don’t, use those coupons! All of these items can be picked up from a craft store. I didn’t capture a photo of probably the most important step, but I have a little one running around, so you’ll forgive me? It is really easy though. Lie out a layer of paper towels onto your work surface. Place the feathers onto the paper towels with the side you want painted facing up. Open up your can of copper spray paint after shaking it up really well. Go ahead and stir it up, too because this stuff separates like crazy. Using the paint brush, pick up some of the paint. Brush onto the lower half of the feather. 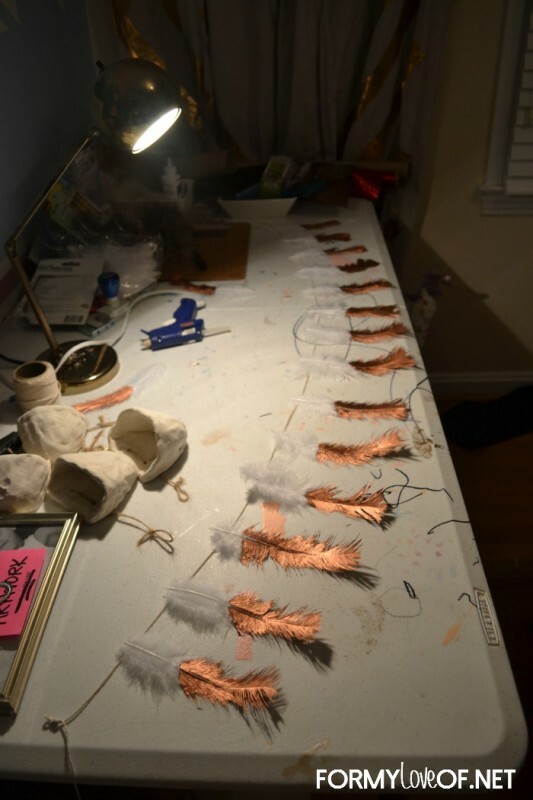 If you buy the fancier feathers, you won’t have to work as hard as this next step, but I’m using the cheap pack of feathers here and I think it turned out great! Use the bristles of the brush to coax the vane back into place. 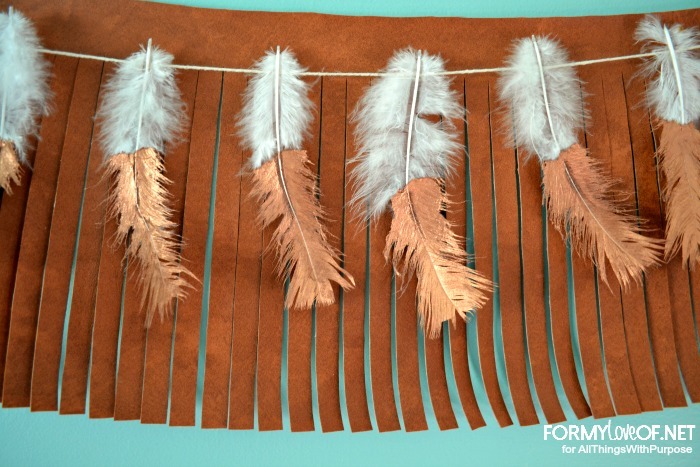 Once the feathers are dry, you can peel them off of the paper towels and lie out string you want them attached to. I used cotton string in a natural color. Space the feathers onto the string in a way that pleases you (It’ll live in your home afterall). 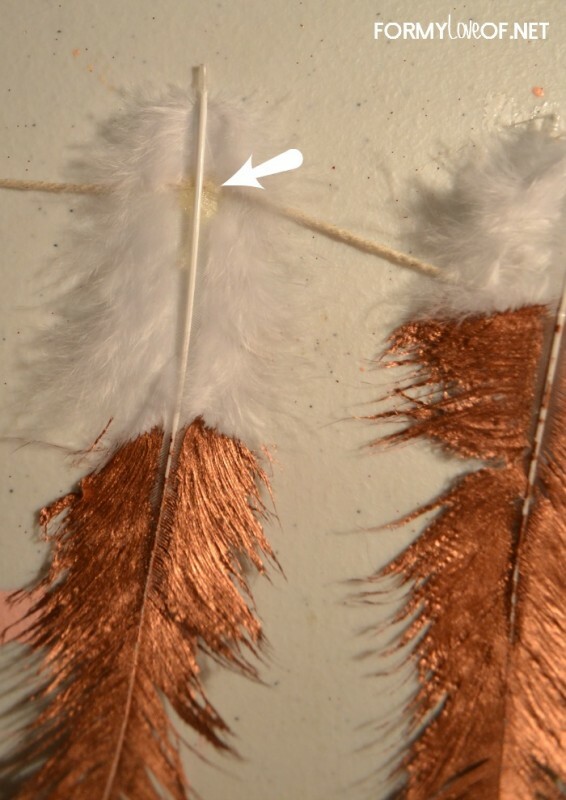 With a pre heated hot glue gun, dollop a small spot of glue onto the string where you want a feather and press the feather into it immediately. 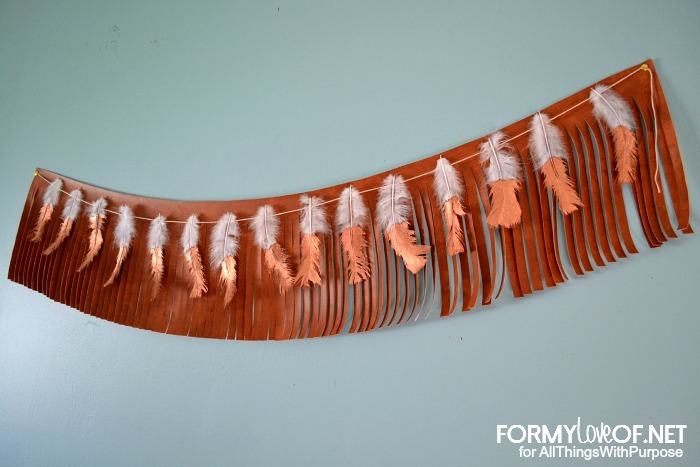 Keep doing this with each of the feathers. Then you’ll need to find a place to hang it. 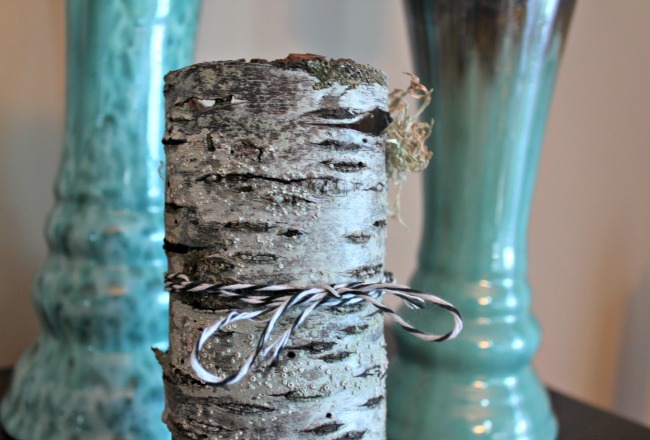 Like overtop a DIY Leather Fringe Banner, or a fireplace mantle, or a doorway! Thanks so much for stopping by to check out my tutorial! Like always, get creative! If you’ve got a different color in mind, or want to mix it up in some other way, do it! I hope to see you back on my blog soon. In fact, maybe you’ll like these adorable miniature wall hanging ornaments I just shared? I can’t seem to get in to your archives for American doll patterns. I’ve entered what has been required with the password that was sent to me. It keeps asking me for the password. Please help. Finally got in with password. Selected pajama pattern, a big picture came up with no place tp print pattern. What am I doing wrong,? I can’t seem to get in to your archives for American doll patterns. I’ve entered what has been required with the password that was sent to me. It keeps asking me for the password. Please help.